Room for more graduates? I believe so. I agree with the Senior Minister of State on this. Last year, I filed a Parliamentary Question and found that there were 41,000 locals studying in private universities in Singapore alone, excluding those doing so overseas. So the number of locals on private degree programmes is almost the same number as that in the funded autonomous universities. That shows many aspires for a university education. One will then quickly argue that it does not necessary show that aspirations means there are enough jobs for graduates in the economy. Purist will argue that we will cheapen our degrees, that we could end up with unemployed and under-employed graduates. Indeed, some have swiftly written to the press about their concerns. These concerns are valid. Like it or not, for years, many have struggled through on their own at private universities here and abroad. For years, some MPs have argued for more university places, right from the time that NUS was the only full university around. I recall reading Mr Chiam See Tong’s occasional battles in parliament with different Education Ministers over education places, and for the establishment of the then-third university. He was told “No”, each time. Gradually though, the number of university places and the number of universities rose till today when we will soon have our 5th and 6th universities. I do not have data on what happens to graduates of private universities and I think no one has the complete picture as well. I have discussed with some private providers about the prospects for their graduates and have myself hired a number of such graduates especially in my previous business. In that business, nearly all staff are graduates and diploma holders. More than half of those who were diploma holders either joined my company already enrolled in a part-time degree programme, or started a part-time degree course during their employment with us. Most went with private universities. Some joined us with a private degree, either obtained after a diploma from one of Singapore’s polytechnic or they had gone entirely via the private route after leaving secondary schools or college. As an employer, I hire based on assessing their skills and attitude, regardless of where their qualifications came from. Experience and qualification may mean a different starting point. However, once they have entered, their qualifications didn’t matter to us anymore. We looked at their work performance. I have shared previously that some who were promoted fastest were not the ones that started with the best qualifications nor from the better known institutions. I know of many others that have done well, some who had new opportunities made available to them after obtaining qualifications from private universities. We have always been having many graduates who did not go through our autonomous universities. With additional 3,000 places per year, it could likely mean that in the initial period, many of the borderline cases who previously would not have qualified for our autonomous universities would now be able to do so and receive government support. So there may not be the influx of 3,000 more graduates per year chasing for limited employment. These 3,000 are just getting better support enroute to earning their degree. With increasing education level and rising grades achieved by students, it had been difficult to get into our autonomous universities. Some who had missed the cut may not necessary be inferior to those who made it through. Admission via the college route is based mostly on the GCE ‘A’ levels results, which measures mainly academic abilities. Late bloomers or those who are more inclined to do better at practice-based courses could find themselves excelling in tertiary studies. Having done less well at GCE ‘A’ levels may not mean they are also not capable of doing well in universities and in their jobs. It is true that we need certain number of graduates with research abilities to fill academia and industry research positions. Singapore would also want to achieve a good standing globally in research publications and patents. These graduates will likely still come from the current autonomous universities that are research based, as these universities are better structured and resourced to do so. There is a place for teaching and practice based universities, to meet the aspirations of Singaporeans for higher learning and to get access to more job opportunities. These can be facilitated by the newer universities. I hope those who fear for under employment of graduates will give more time for the graduates of the new universities to prove themselves. Given that many of the higher achieving graduates of private universities in the past have secured good jobs, it should give us encouragement that there are enough jobs for the graduands of the 5th and 6th universities. The other thing that concerns me is that we have grown accustomed to the government providing pathways for us. Sure, graduates who slogged through rigorous academic routines would expect themselves to be rewarded with better job prospects. It is also the duty of policymakers to try to match training with industry demand, though it is not always possible to achieve this well. The world is fast changing. Technology is fast advancing and business models are constantly being changed as barriers are broken down by the highly connected and dynamic world. It is hard to accurately plan for what the economic and jobs scenarios will be for a current primary school child who will only start work 10-20 years later. We need to fall back on the basics of education, which is to fill the mind and enable the person with skills and with the attitude to learn continuously. We may not always do the job we are trained for but it should not stop anyone from constantly adapting and relearning. I recall a conference some ten years ago which I attended where Carly Fiorina, then-CEO of HP was speaking in. It struck me in her introduction that she graduated with Bachelor of Arts in History and Medieval History, yet rose to head one of the largest technology firm. I recall her joking about her study of Anthropology. Granted that her tenure at HP turned out to be eventful. My point is that she probably used little of what was taught in her university course but must have adapted and learnt along the way to rise to the top in the engineering world. In our education system, we may have focused too much on testing, sorting students out and planning for their future much like running a manufacturing plant. Students have been ingrained with a mindset to study well and get into good schools so as to secure their future. It may be so in the past, but with a constantly changing world, it is difficult to continue to provide that assurance. Innovation and global enterprises are difficult to be engineered precisely. For our people to succeed in the new world, they must have creativity, innovativeness, adaptability and a desire to constantly relearn. I hope even as we discussed about how many places to provide for higher learning, we must not forget to work in at all levels of education to break out of the mindset that the system can plan for everything. It ought to be cultivated into our next generation that education is to build their mind, and they need to adapt themselves to the 21st century and seize opportunities that come along the way. The emphasis should not be just on knowledge and skills, but also on developing the right attitude to life, such as confidence, resilience, character and love for learning. That can help our increasing pool of graduates stay relevant in the changing economy by the graduates themselves being adaptable to changing environments. There were several policy areas in the National Day rally speeches that caught my attention last evening. First was hearing Education Minister Heng Swee Kiat speak of the dangers of extreme meritocracy, which had led to holistic education being sacrificed, amongst others. It brought my mind back to my maiden parliamentary speech in October last year. I had used the term “hyper-meritocracy”. Subsequently, I made various blog posts on this topic as well. It refers essentially to the same thing as what the Minister spoke about, that we have relied too much on performance in academic tests to judge abilities and this has led to a winner-takes-all society. Acknowledging that there is a serious problem is a start. There have been some good initiatives by MOE, but set against our reliance on a stressful examination culture, many of the programmes fail to deliver the outcomes hoped for. I hope the Minister will show he means business and tackle head-on this phenomena of extreme meritocracy, dealing even with sacred cows in the education system if he has to. Next, I am glad to hear that the year-long study on higher education has led to more places for Singaporeans and to the formalisation of SIM and SIT as the 5th and 6th universities. In October last year, I had sought to find the gap between Singaporeans’ aspiration for a university education and the places in our autonomous universities. The answer is a staggering 41,000 locals in private universities in Singapore. This number excludes Singaporeans studying in overseas universities. The number of Singaporeans studying unsubsidised could be as high as those in the autonomous universities. That signalled that we have been significantly underproviding in this area. The preschool initiatives were of great interest to me too. I was a member of the REACH Policy Study Workgroup on Education that in 2009 had made various recommendations in preschool, including asking for preschool education to be put under one ministry – MOE, greater funding to support preschool operations and for the government to run some preschool centres especially for the lower income group. I was then disappointed that these views, painstakenly gathered from two years of interviews by the committee, were rather quickly dismissed. From time to time, various groups have surfaced somewhat similar views; and this time, more actions were finally taken. The new initiatives also called for more anchor operators other than NTUC and PCF. I have been a long-time participant and observer in various capacities in this industry. I think it is high time that the industry be more inclusive of all operators, including private operators. Operators other than the pre-selected anchor operators have long operated under challenging conditions, hampered by an unlevel playing field. I had raised various questions and speeches in parliament over the past year regarding the way this industry has been structured. I reserve additional comments on this topic until further details are out. I hope any government policy in this field can be more inclusive than what it has been in the past. Finally on the National Conversation, I think there are already many views out there, especially online, if the government is to listen more carefully. And some views are quite sensible, contrary to what some policymakers may sometimes say about online feedback. What I am more interested to know is, how will the sacred cows be dealt with? We have many. Former Straits Times associate editor Bertha Henson listed some interesting ones on her blog: ISA, detention without trial, death penalty, annual licensing requirement for newspapers, and others. I will say the proof of the pudding is in the eating. How seriously will these sacred cows be dealt with? Time will tell. TODAY newspaper did a feature of “Teach Less, Learn More”(TLLM), interviewing parents, educators and policymakers. There were mixed responses, with some supportive and some skeptical if TLLM was working at all. It touched on something I felt strongly about, so even in danger of repeating my earlier stated points and proposals, I decided to write a piece to add my views to the debate. TLLM itself is a useful concept. It encourages educators to look at how they can teach in a less didactic way. There are many ways to enourage learning and to cater to students of different learning styles. Having been an active participant in the local education scene in the past decade, I had the privilege of being involved as service provider to schools in implementing TLLM ideas. I could see schools and educators trying to implement new ideas and to try meet the objectives of TLLM. The main challenge facing educators is in the system that they need to implement TLLM under. While MOE may have been encouraging new ideas for teaching and learning, initiated holistic assessment and even done away with the need for examinations in primary 1 and 2, there has been no change made to the PSLE, the big sacred cow in our education system, as well as other deeply ingrained practices of branding, ranking and streaming. The stakes are high. Our education system fundamentally believes in streaming students into the pathways appropriate for them. It is done not just once but at fairly regular intervals from the age of 9 so that students are ‘properly matched’ to their performance levels. There’s a strong belief in selecting the cream of the crop and putting good resources to develop them. This has led to a highly competitive culture. While there are other sorting exercises earlier such as for Gifted Education Programme (GEP) and for subject banding, the first major examination that determines the pathway for each and every child is the PSLE. With the way branding and ranking of schools have been promoted, parents are no longer happy with just having their children into any school for express stream, or even into just any Integrated Programme school. They believe, and not without justification, that being in the top schools will enhance their children’s chances of landing scholarships and top government jobs in the future. A friend whose son is in Raffles Insitution told me, the system is like a black box. You get your child in and somehow the Raffles black box will figure its way of securing the child a safe pathway for the future. He will be on his way to a top professional job or scholarship. Life will be good, at least financially. My friend believes his job is to get his children in and let this black box work its magic. Parents who are sufficiently endowed will figure ways to get the better of the system. If schools teach less, they tuition more. If there’s no examinations at primary 1 and 2, some parents will buy past year examination papers or send their children for testing by tuition centres to make sure their children are on top of their peers. If being in the GEP gives their children an advantage to enter top independent secondary schools regardless of PSLE score, some will find a way to tuition their children into the programme. If the textbooks and notes the school provide are deemed insufficient, parents will find a way to get the best resources targeted to generate the required PSLE results. Indeed, when speaking to a group of highly aware parents about our education system, one mother brought along a big bag of highly preferred materials (alternative textbooks and multimedia materials) that certain top primary schools use in place of textbooks. These materials were shared with her by other highly involved parents who know where school-provided resources and methods are lacking in, and what they must do to get the results. Over the years, this has led to an inflation of grades for those who have the means to get the better of the system. National examiners will then figure ways to throw some challenging and even ‘beyond syllabus’ questions into high stake examinations to differentiate the really high performing students. Those without the means may find themselves trying to catch up in large class sizes of 40 or sometimes even more students. Holistic assessment sounds good. Many primary schools have already implemented it. It is a useful way to gauge the child beyond academic grades at key examinations. However, when it comes to the PSLE, it is no longer about holistic assessment. It is no longer about creative thinking. It is about getting the results that will put you on the correct end of the national bell curve. All that will be decided in a matter of a few days in October and over a couple of hours per day. All schools would have by now tried varied and their own interpretations of TLLM. A good number of primary schools are already on interesting programmes like Programme for Active Learning (PAL) at the lower levels and holistic assessment either at selected levels or throughout the schooling period. But when it comes to the primary 6 level, everything else is put on hold. A typical neighhourhood school may stop all teaching by June and from term 3, drill primary 6 students daily for the PSLE. A friend whose two sons completed primary education at a top primary school told me the school had already covered the syllabus by the end of primary 5. For the entire primary 6 year, it was all about PSLE preparation – endless revisions, drills and mock tests. It was with these in mind that I proposed during the Committee of Supply debate in March to start experimental schools that through train from primary 1 to secondary 4. Given the deep seated culture of high stake examinations and branding of schools, it will be impossible to change the system overnight across all schools. Hence, I think a practical way to examine this issue is to allow certain school groups who are already doing primary and secondary programmes to through-train for these 10 years. There will be plenty of opportunities to work out creative TLLM programmes, holistic assessment and character and values development without being interrupted by the PSLE. To avoid putting excessive pressure on parents wanting their children to be in these experiemental schools, we can avoid involving the top secondary schools in this phase of the implementation. Students wanting to be in these top secondary schools will still go through the PSLE. Students in the through-train experimental schools should be discouraged from taking the PSLE to avoid them taking these schools as an insurance for secondary schools. These schools simply shouldn’t prepare children for the PSLE. Parents who send children to these schools must subscribe to the education philosophy of the school for the important 10 years of their children’s education. I believe there are enough parents wanting such schools. And if we can show positively that students are no worse off at the end of the 10 years’ journey, we can start to seriously look at whether the PSLE is really that important and if a more major revamp of the entire education system should take place. There are calls for rethinking Singapore, for sacred cows to be sacrificed if necessary. There are many sacred cows in the education system. How many of these will be looked at objectively and critically? I never knew I could be this good! Two months ago, I was conducting the weekly open house at The Workers’ Party HQ. Two young men came in panting midway through the session. They had gone to the wrong end of a rather long Syed Alwi Road, finally located our office and rushed over before the session closed. I had an interesting chat with them despite the short time remaining. One is a Singaporean who has been working and living in China for several years. He is happily married there with a young child and is now the investor manager for a China public listed firm. He was back on a holiday to Singapore. As we chatted, we strayed into their education background. Both were classmates in a neighbourhood school in Bedok. They were from the Normal Academic stream. One went to polytechnic and is now a home-based entrepreneur in Singapore. The one currently in China went to a private education organisation in Singapore and graduated with a degree awarded by an overseas university. He paid full fees, with no subsidy by our government, of course. He had failed to make it to our local universities. A confident young man indeed. Independent, articulate and fluent in mandarin. We conversed further as I was curious what it was like for them in our local schools being behind many others academically and having failed to make the cut into our local universities. Throughout their academic studies here, they had felt they were not good enough. They had not done well in their examinations. Yet here they are now, doing well in their careers. His words have stuck in my head since that day. “I never knew I could be this good!”. Why? Because he had not done well enough in examinations. He became confident later after striking it out abroad and discovering he could actually be quite good. His family had to fork out a lot for his education in a private institution. He was not one of the 25% of his cohort that qualifed for our local universities. I had asked in February this year on the number of Singaporeans pursuing private undergraduate courses. The figure is astonishing. 41,000 locals are currently enrolled in private universities and private education institutions on undergraduate programmes alone. That’s about the number of locals in the government funded universities. The government does not keep track of Singaporeans enrolled in undergraduate courses overseas. There must be many more in this category. I see two issues here. The first is whether the number of places in our local universities are sufficient to meet the aspirations of Singaporeans. 41,000 locals in private undergradate courses plus many more overseas. Are we grossly underproviding and the market had to step up to meet this aspiration, with no support from the government? The young man I met is one of them. Fortunately for him, his family could afford it. He received the education, landed a good job in China and did well there. A study on higher education has been going on since last year. I await eagerly to see the recommendations that will come forth to see how we can better meet Singaporeans’ increasing aspirations for higher education and to make fees affordable. I am glad the story turned out well for my new young friend. It could have turned out differently. How much do our students believe that they can be good at something, regardless of academic results? How sufficiently have we provided for to meet rising education aspirations? How well are we preparing students for the test of life? Test of life or a life of tests? 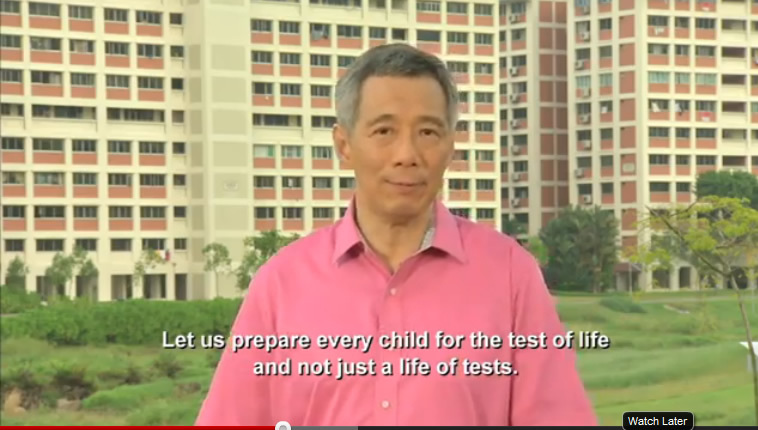 One statment in Prime Minister Lee Hsien Loong’s 2012 National Day Speech caught my attention. He had called for preparing our children for the test of life rather than a life of tests. The statement sounded familiar, so I searched online. In 2004, when then-Education Minister Tharman Shanmugaratnam launched the TLLM initiative, he had said, “The teacher is the heart of ‘Teach Less, Learn More’ (TLLM). TLLM is not a call for ‘teacher to do less.’ It is a call to educators to teach better, to engage our students and prepare them for life, rather than to teach for tests and examinations.” The search also returned MOE’s document on TLLM, which amongst other things had called for teachers to achieve this same objective for students in almost the exact words as that of the Prime Minister’s. 2004 was 8 years ago. Have we moved closer towards this goal? Are we tuitioning more to keep pace with grades inflation in schools? Are parents pushing children harder for tests, especially for the high stake examinations? What changes have been undertaken to move closer towards this objective set out in 2004? Perhaps the call was sincere. It is a noble objective that no one can disagree with. Perhaps the schools did try hard to meet the objectives. TLLM may have been implemented and fine-tuned along the way, but our system of high stake examinations, streaming and branding of schools have not. In fact, MOE has implemented even greater differentiation of schools. Integrated Programme from secondary through college has now been expanded to take in approximately the top 10% of each cohort. Specialised Normal Technical schools will start from 2013, where such schools will only accept students in the Normal Technical stream. PSLE continues to be the all-important sorting examination, where one examination will determine the stream and type of schools a child will get into. There is low mobility between streams. I had observed this in talking to parents and educators. My parliamentary question in February 2012 confirmed that around 6% in the normal technical stream were able to progress to normal academic. My anecdotal observation of movement between other streams is around that figure or even lower. Parents naturally worry for their children for fear of them getting into a less desired stream. All schools are supposed to be good schools. Do parents believe this? If they do, why are parents so anxious every July to get their children into the most desired primary schools despite MOE’s best efforts to assure parents that all schools are good? If all schools are good, why are grades output so different between top primary schools and the least performing ones? After all, students enter at primary 1 should theoretically be evenly spread out so we should have a good spread of better and weaker students academically amongst schools. Why are parents spending more and more money each year on tuition? Why are there Gifted Education Programme (GEP) preparatory classes that commands such high fees unless parents are desperate for their children to be in GEP? And why do they want their children to be in GEP so badly? I had written an earlier blog post about the Direct School Admission and the Edusave Entrance Scholarships for Independent Schools (EESIS) advantages which GEP students get over other students. GEP is now seen by parents as an early admission into top secondary schools, determined by GEP tests at age 9. How can we achieve PM’s objective under such an environment where there are constant testing and streaming to sort students out, and when schools are measured based on the results of the students they produce? Granted that MOE had implemented other forms of measurements to grade the performance of schools in non academic areas as well. But do parents look at these other forms of measurements or are they just looking at the grades output of students? Even within academic streams, schools are now neatly sorted according to the PSLE T-Scores of students they admit. Take a look for example, at the Express stream in secondary schools. When a school’s PSLE T-Score cutoff point is say 220, you will get students at 220 and mostly just above it, with only a handful who may have scored 230 and above and had selected that school despite being able to go to a school with higher T-Score cuttoff. Years of branding and ranking of schools have created this natural sorting mechanism where parents will now sort the schools out within each streaming category. Parents anxious for their child to be in a ‘better’ school will resort to tuition to push the grades higher, creating an inflation of grades over the years. Readers of my blog post can judge for themselves if since 2004, we had moved closer towards preparing students for the test of life and not a life of tests. I cannot think of how we can change the situation unless the system is changed. It will be insanity to assume it can be changed under the same operating context, with parents as kiasu as ever and even more so over the years, and with a meritocratic system that measures success rather narrowly by grades. One change I had suggested in my Committee of Supply parliamentary speech in March is to consider pilot schools that run integrated programme to progress a student from primary 1 to secondary 4. There are parents like myself who do not care for putting our children into a few top schools, but we still have to go through PSLE. There are the dreaded consequences of slip up in just those few hours of tests for a child at age 12, with low mobility for them out of the a less desired stream should they slip. Parents like me will still have to subject our children to a life of tests. I called only for pilot schools in my proposal because I know there are parents who would want their children to be pushed and tested to get to the top schools. Hence, they can go to the regular schools and take PSLE. I was pleasantly surprised to find my fellow parliamentarian, NMP Mr Laurence Lien making a similar call in that same Committee of Supply speech advocating almost the same thing. Like me, he and a group of parents do not believe in sorting their children at primary 6. However, we have no alternatives to turn to currently if we still want our children to receive their education in Singapore. This is but one proposal that can be implemented if we do want to change the system; if we think the current system is not able to move us closer to the objective that had been set. Do we believe a change in the system is required? Do we have the will to make that change? Will the situation improve in another 8 years without any change? What do you think? The recent case of math tutor Kelvin Ong who cheated with false credentials is disturbing on two counts. First, in a lucrative and highly unregulated industry that is overly subscribed to by the majority of parents in Singapore, it is all too easy to get away with fake credentials. Perhaps Kelvin Ong carried his boasts too far. He was never a gifted education student himself, never studied in a GEP school and at NUS which he had claimed, and was merely a relief teacher briefly in a school. In fact, it turned out that he was not a university graduate at all, much less a double mathematics major at NUS. He simply played on parents’ anxiety to get their children into the gifted education progaramme (GEP) and threw up credentials hoping to get away with it. And it seemed he did so for a number of years before MOE, which usually do not intervene in the private tuition market, stepped in to expose his claims. NUS followed suit by verifying that he never attended their programmes. I am glad MOE took the initial step to expose Kelvin or else more unsuspecting public will be tricked. That begs the question how many had practised this trade with fake claims unexposed, perhaps because they never carried it as loudly and as boldly as Kelvin did. It is hard for parents to verify claims as they usually trust the tutor or the centre to be honest with the credentials. Not all parents are also academically equipped to tell if a tutor is really teaching well or not, and the child may not be able to tell or may not bother to complain to the parents if the tutor does not seem up to the mark. Private teachers can also be registered with MOE online. The process and requirements are simple. It does not equate to teachers being National Institute of Education (NIE)-trained. Some tutors will also be advertised as having taught in MOE schools. Aparently, after he was exposed, Kelvin Ong reportedly said he had work as a relief teacher from 2002 – 2003 in a GEP school. There are several schemes nowadays that allow a non-NIE trained person to work in schools as allied educators, as relief teachers or with external service providers running enrichment programmes in schools. They would certainly have taught in schools but they may not have gone through the thorough and stringent training at NIE to be a true MOE qualified teacher. One can say that tuition is something that is not part of our official education system. It is something parents desire and go into a contract with the tutor or with a tuition centre. However, the number of children having tuition is staggering. There are no official figures because there are many unregistered centres and even registered tuition centres do not report their enrolment to any authorities. A recent survey estimates 2/3 of students have tuition, but I suspect from my observation that this figure could be even higer. Administratively, MOE is not set up to have any resources to verify with every centre and with every tutor on a periodic basis to ensure quality. Hence, it implemented a simple registration process that is in no way a valid measure of the quality of the centre or the tutor. It is easy for tutors and tuition centres to make false claims and credentials because there is no agency actively monitoring them, unless the claims have become so blatant and eye catching that warrants attention, like in Kelvin Ong’s case. The second disturbing aspect is why there are so many parents desperate for tuition. In this case, it is tuition to prepare for the gifted education programme test, which technically should not be trained for because the tests are supposed to pick up natural giftedness. Yet parents had spent big time on Kelvin Ong and on other tuition centres advertising for GEP preparatory training. You can search online for “GEP prepatory classes” to see that such courses are common. I had previously organised a few focus group discussions with parents to understand their mindset about GEP. It seems there are two strong reasons for parents to want their child in GEP. The first compelling reason seems to be Direct School Admission (DSA) into the most desired independent schools at secondary 1. It seems independent schools roll out the red carpet for GEP students, so that when students are selected based on their GEP results in school, they only need to have a low minimum T-Score (usually 200) in PSLE to enter these top schools. I filed a parliamentary question in July to find out how many from GEP enter secondary school by DSA, and how many into the independent schools. 80% from GEP enter secondary school by DSA and 78% receives the Edusave Entrance Scholarships for Independent Schools (EESIS), which covers their tuition fees in these schools which are priced higher than other schools. That means 80% of the GEP students do not need to worry about their PSLE results. They enter into secondary 1 directly. “The EESIS are awarded up to the top one-third of the total number of Secondary One pupils admitted to all Independent Schools (IS), based on their PSLE results. 78% of GEP students (which is almost the 80% DSA figure) receive EESIS yearly. It does not seem to matter what their PSLE T-Score is, because as long as the GEP student is promoted to secondary 1 in the Integrated Programme (IP) of an Independent School, the GEP student receives the scholarship. Independent schools comprised the top schools most desired by parents for their children. So entering GEP means an early and near assurance for the child to enter top schools like RI, RGS, Hwa Chong and Nanyang Girls High without having to compete with the rest of the cohort, and to get EESIS regardless of PSLE T-Score. Hence, parents are anxious to have this first shot at enrolling their child in the top secondary schools at primary 3. A second reason is the programme itself, which comes with a small class size of 25 students, smaller than the typical 40-44 in other schools. Parents with children in both normal schools and in GEP tell me the small class size makes a lot of difference. Why would it not be with better attention that teachers can give to the smaller class. The GEP teachers are also specially handpicked to be in the programme and have gone through special training. Parents would naturally want these advantages for their children. It seems ironical that we can throw lots of resources at this 1% of students who mostly are naturally be able to do well regardless of the teachers but we are not able to commit similar resources at the lowest groups that need the smaller class size to help them catch up. I think it is time to look at the situation. On the first count of lax regulations governing the industry, more could be done. Perhaps some registration body that verifies the certificates of tutors wishing to be registered tutors. This need not be done by MOE but can be by an association, for a reasonable membership or verification fee to list tutors on the database. Parents can then check the credentials of tutors from the online database without having to embarress the tutor by demanding to see proof of qualifications. MOE lacks the resources to regulate the tuition industry under its current setup. It already has its hands full regulating the private education industry targetted at certification programmes for older students. While tuition can be said to be a private matter between parents and tution centres / tutors, I think more can be done by MOE to step in to shape the industry. I doubt an association of tutors would form naturally unless MOE intervenes to insist teachers on its registered database must first be on the association’s database. Getting registered centres to report their students enrolment and to keep an updated register of their teachers faithfully is also another step that can provide better data for MOE to monitor the situation. I also hope MOE can take a review of the GEP programme to see if the DSA and EESIS advantages need to be in the system. If the motivation is to provide good programmes for these specifically identifed 1% of the cohort, there is no need for DSA and EESIS. The GEP students can go through normal DSA and compete for EESIS like all other PSLE students. Perhaps MOE can even critically examine if there is a need for centralised GEP and if they can decentralise the good aspects of GEP into every school, so that students need not be disrupted at primary 4 to be transferred to GEP schools. We should have faith that every school can be a good school and that we can work out programmes for good students in neighbourhood schools without having to signal that ‘good’ students must be uprooted to ‘good’ schools. I also hope MOE can work more on assuring parents that teachers can sufficiently cover the curriculum without parents feeling that they require tuition to help their children catch up. One major problem is the class size. With 40 and more in a class, it is a challenge especially in some neighbourhood schools to get students to pay attention to the teaching. We should examine how class sizes can be cut across all primary and secondary levels and how MOE’s budget or teachers’ loads can be rebalanced to achieve this. On 1 Aug, Singapore received an early birthday gift for her National Day when Feng Tian Wei won Singapore’s first individual Olympics medal since Tan Howe Liang’s silver in 1960. I posted a simple “Congratulations Tianwei!” message on my Facebook. Not unsurprisingly, it garnered positive comments as well as a number of uncomplimentary remarks about our use of foreign talents. Feng Tianwei was born on 31 August 1986 in Harbin, PRC. She is the only daughter of Feng Qingzhi, a granary worker, and his wife Li Chunping, an employee of a department store. Feng’s parents, who were poor, lived frugally for years to pay for her table tennis training. Her father suffered from multiple sclerosis, but she was not told how severe his illness was. He died in 2002, weeks before Feng tried out for China’s national B squad. Although Feng topped the qualifying matches a month later and was called up for the national team in 2003, she suffered from a long illness; a source close to her said it was “because she missed her father too much”. Feng left China in 2005 to play in the Japanese professional league. While there, she was spotted by a coach with the Singapore Table Tennis Association, in 2006. In March 2007 she was invited to train in Singapore under the Foreign Sports Talent Scheme. She became a Singapore citizen in January 2008. For Tianwei to be where she is today, she had to work hard and overcome many personal struggles. That’s great resilience and something worthy of celebrating in a human’s achievement. From what I have read of her in the media, she has so far been a good sports person and without any controversial news that I am aware of. We also had Shanghai-born Jing Junhong who was the first to break into the semi-finals of an Olympic table tennis singles in Sydney 2000. She is now married to Singaporean former paddler and Table Tennis team manager Loy Soo Han. Junhong is a coach for Team Singapore as well. They have a son, Darren Loy who is now in Singapore’s junior Table Tennis team. When I made a national day blog post last year, some netizens commented in unflattery tones that my parents came from Malaysia. It didn’t matter to them that I was born here or that my parents came when Singapore was part of Malaya and that they had long become Singapore citizens. We cannot choose where to be born in, nor can we choose our parents. From what I read, I would say Junhong has integrated well into Singapore, establishing her family here, producing a son who is now representing Singapore, and training our national team. Tianwei has been fighting for medals in Singapore’s name since 2008. She came to us as world no. 73 and is now world no. 6 and an Olympic individual medalist. Tao Li came to Singapore at age 13, speaking hardly any English at all. Today, she conducts her interviews regularly in English, with the occasional “lah”s in it. That had me reflecting why each time a foreign-born sports person wins something for Singapore, we have such a large number of unhappy people. The problem may not lie in the athletes themselves. Having large number of foreigners injected into our midst over the past two decades has created many problems in society. Unfortunately, some people will project the problems we are facing with foreigners onto all non local-born. Irresponsible headlines by the media like “Feng Tianwei shows FT is the way” (The New Paper, 3 Aug) only serves to stir up more resentment amongst locals. I recall when I was younger, foreigner means fair-skinned ‘ang mohs’ (the westerners), who did not get into the way of locals very much. We have always been having Malaysians and people from ASEAN in our midst, mostly as students and as workers, with some as professionals. We never complained so much then. Culturally, they are closer to us and live quite like Singaporeans. A fair number of Malaysians who study here regularly become PRs and citizens. Foreign domestic workers have also long been a feature in Singapore as well. They gather mainly at specific spots during the weekends. The jobs done by the workers and foreign domestic workers are also not the ones that Singaporeans aspire for. In 1990, Singapore celebrated ’25 years of nationhood and another 25 years of achievements’. That was the slogan of the National Day parade of 1990. The theme of the parade that year was “One People, One Nation, One Singapore”. Back then, our population was 3.047 million, of which 2.634 million were citizens and 112,000 were permanent residents (PRs). Foreigners made up around 311,000, or 10.2%. Together, PRs and foreigners made up a total of only 13.9%. Singaporeans did not seem to have any major issues with foreigners then. By 2011, our population grew to 5.184 million. Of these, there were 3.257 million citizens (including new citizens), 532,000 PRs, and 1.394 million foreigners. Foreigners constituted 26.9% while PRs and foreigners together formed 37.2%. When we combine this figure with another 15,000 – 20,000 foreign-born that are being added yearly as new citizens, the percentage of local-born citizens becomes even smaller. Source: http://www.singstat.gov.sg/pubn/popn/population2011.pdf (with rounding off). In 1990, we had by then built the nation largely on Singaporeans. We were of different races, but we formed the vast majority of the population and we understood each other’s habits, religions and cultures. Sure, it didn’t happen naturally. It took some effort to constantly remind ourselves of the diversity amongst us. We could live with and adjust to one another. We were indeed one people, one nation, one Singapore. I love to travel. I would mix around the locals when I travel, take their local transport, eat at their local eateries, buy at local joints and do things locals do. My travels were all self planned itineraries. You get to understand people better that way. China has been quite an experience. In one of my early trips to China, I was once stuck in Pudong, Shanghai at night with three young children in the drizzle trying to catch a cab to Puxi across the river with our bags of shopping. There was no queuing bay. Many people were on the streets trying to grab a cab too. The locals were rough. I had people cut me off even though cabs alighted passengers in front of me. I nearly got into one after I had negotiated with the driver through his window where we wanted to go when suddenly, a young couple barged into the cab and the cab took off with them. Half an hour later, a taxi driver who had been parked on the side all this while drove over and told me that this is Shanghai. He said I would never get into a cab by being so mild, and that I should just jump into the first cab and demand to be taken to where I want. He said he was taking me on account of my three young kids, as he usually would not go across the river at that time of the night. Another Singaporean friend who had been living for several years in China told me in a cab one day at a chaotic traffic junction in Shanghai that there is only one rule to follow at such junctions in the cities. The car whose head juts out first has the right of way. Forget about official traffic rules. Hence they drive aggressively. I noticed this too in some crowded Asian cities. I watched a recent video that had gone viral on the Internet of a China woman scolding two elderly Singaporean ladies over the priorty seating on a bus. I have seen such scenes in China. People are conditioned to demand their rights, sometimes in loud and forceful ways because in their system, you will lose out if you are too gentle. I found out the hard way trying to get my cab. We may be seen as sharing the same ethnicity. Our way of life has become very different though. China had gone through a traumatic cultural revolution and now a long economic boom. It is a big country where people may have grown used to roughing things out. I do not wish to generalise that all from China behave badly, or that foreigners of other nationalities do not bring with them issues that also challenge the integration with Singaporeans. I have chinese friends who are cultured and who have decided to set roots in Singapore. But with so many foreigners of so many nationalities, each with their own deep-seated culture that had shaped their behaviours, our way of life is bound to become upset; from bus quarrels to spitting on roads to complaints about curry cooking. It does not help that in some areas, foreigners may even outnumber locals as the foreigners tend to be clustered together by their communities. It also does not help in our multi-cultured society that some of them work as service staff but speak no English at all. When I was a student, I remember the many campaigns to teach us how we should behave as responsible Singaporeans. I remember the ‘Use Your Hands’, anti-littering and courtesy campaigns. I remember once a few of us did an overnight hike to a secluded part of Pulau Ubin while we were college students. The next morning, we packed up to leave. We had a few bags of rubbish. Our first tendency was to leave the rubbish there since the nearest dustbin was several kilometers away, past a plantation we had hiked through. Someone from the group picked up the rubbish bags and carried it along, together with his camping load. Another asked why he didn’t just leave it behind. He said, no, we should not litter the place. I still remember such lessons well to know that we should not litter. How do we tell that to 37.2% of the population (more if we count new citizens) who had not gone through our education system? How do we teach courtesy to those who grew up believing they need to demand aggressively to get what they want, and where spitting and littering are acceptable where they used to live? Will their way of life influence us instead and undo what we had learnt from young? I am not anti-foreigner. I have spoken out before on such issues like foreign scholarships. That is because I feel the policy had spent to much, took in too many, failed to attract people of the right quality, and failed to get them to root themselves in Singapore. People like Junhong, Tianwei and Tao Li have done Singapore proud on the sports front. I wish all foreign-born sports person in Singapore can follow the example of Junhong and truly root themselves here even when their competing career is over. The issue of foreigners in our midst will continue to be hotly debated, even more so in the coming months with the recently publised paper on Population. The call to be ‘One People, One Nation, One Singapore’ is even more urgent today than it was in 1990, when there were then fewer cracks in society. Today, the cracks are between the haves and a growing class of haves-not, between local born citizens and a sizeable pool of new citizens and between residents and a very large number of foreigners. We may have 47 years of economic progress as a nation, but do the newer citizens and permanent residents have the same understanding as other Singaporeans of ‘One People, One Nation, One Singapore’? That is the unenviable challenge that the PAP government has set for itself by its policy of liberal immigration.